Why choose to run over 5,300 miles over three months when you can be at home with your family and friends? After 31-year-old ultrarunner Pete Kostelnick’s 2016 record-setting transcontinental run across America (3,067 miles from San Francisco City Hall to New York City Hall in 42 days, 6 hours and 30 minutes) he felt empty. He had passed through the United States but didn’t feel as if he had really experienced it. Kostelnick thrives on challenges. “If the dream doesn’t scare you, then it’s not worth chasing after,” he said. True to his financial analyst nature, he began researching various possibilities. Having been to Alaska’s Kenai Peninsula before, he had fallen in love with its tourist appeal, complete with glaciers, hiking and fishing. He became obsessed with researching routes from Anchor Point on the Kenai Peninsula in Alaska, to the southernmost tip of the United States, Key West, Florida. Considering his speed and efficiency as a runner, he estimated that if he managed 50-55 miles a day, it would be possible to take in the scenery, document his journey and get some rest, too. The pieces of the puzzle fell into place over time, giving way to the Kenai to Key West journey, or Ke2Key as Kostelnick called it, consisting of over 5,300 miles of road through Alaska, Canada and the United States. The intention was an adventure that merged the best of both worlds for Kostelnick: a self-supported running road trip that enabled him to document his journey and take in the landscape. His goal was to complete the run in 110 days, which meant he would have to run roughly two marathons (52 miles) daily. In the months leading up to his adventure Kostelnick meticulously mapped out the running route, places to sleep, gas stations and convenience stores to buy food, and calculated his daily calorie intake – he knew he had to average 7–8,000 calories a day to remain strong and steady. While he was on the road, his sister back in Iowa would serve as his co-pilot in assisting him with navigation and finding motels and campgrounds. He was aware that there would be days of solitude along the highway, and days spent on heavily trafficked roads. What he didn’t know was how his body would hold up. On July 31, 2018, Kostelnick set out from Anchor Point, the westernmost point on the North American highway system, and began running – his jogging stroller filled with supplies. On day five, he remembers moving alongside heavy traffic, until he came to a quiet road. “It was like being out in the ocean in a kayak – so much open space ahead of me,” said Kostelnick. He camped out that night and recalled, “(it was) sobering to be so far away from family and friends – so far away from anyone and everything.” Throughout those first two weeks, there were times when he woke up in the middle of the night and didn’t know where he was. Reality set in that he had no car or crew out there with him, and a sense of desperation took hold. He struggled through the uninhabited Yukon stretches, often running for hundreds of miles without encountering a grocery store. It took time for him to embrace his self-reliant adventure and come to enjoy living-on-the edge during his quest. 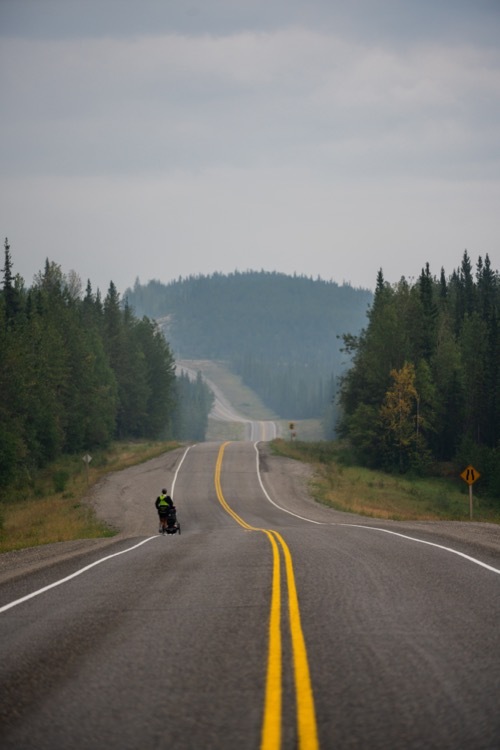 On day 23, wildfires along the Alaska Highway forced him to take the day off, which was followed by a 90-mile day to make up the distance. For the first 35 days, he lived on trail mix from gas stations along the Alaska Highway – a great calorie-dense staple – and chili, which he was able to purchase in cans and eat cold. He also relied on granola and protein bars. Beyond the Alaska Highway he entered the world of fast-food restaurants, and transitioned to eating at Subway chains and some burgers along the way. Start running: 5:30 or 6 a.m.
Stocked with supplies and food, Pete’s jogging stroller was 70-80 pounds. “Windy days were tough pushing the extra weight,” Kostelnick noted. There were a few times during his run when he didn’t have much choice where he slept. “A lot of the places I slept at night were not on Google Maps, so when I came upon them, it was hit or miss if they were open,” said Kostelnick. Somehow, it always worked out for him. Lack of motivation was not an issue for Kostelnick. Once on the open road, he never doubted his adventure, the result of a fair share of logistical and mental planning. Some mornings were rainy or cold, and sure, it would have been nice to sleep in and stay warm, but he never felt that he was in over his head. It didn’t hurt that his wife, family and friends joined him for miles at points in his adventure, with a big show of support for him when he reached his home state of Iowa. He looked forward each day to getting an early start, and loved arriving in a different location each night. Kostelnick’s greatest learning from his adventure had to do with patience. “There were a lot of times that I could have lost it,” he said. There was the day he had to take off from running due to the forest fire, which meant he had to do a double run the next day to make up for lost mileage. There were the flat tires on his running stroller which left him to run along the road with flats until he arrived at a motel where his sister sent replacement tires. It would have been easy for him to fall apart, but being alone, he realized it was better to stay calm and keep his blood pressure intact. Perhaps his biggest lesson from not having a crew with him to solve his daily issues was that he had the ability to solve problems himself, if he remained open, focused and patient. Although runners and friends joined him throughout his journey, when it came to the last 50-mile stretch of his adventure in southern Florida, he asked his friends and wife to meet him at the finish so that he could run solo. He wanted to reflect on his adventures over the past three months. 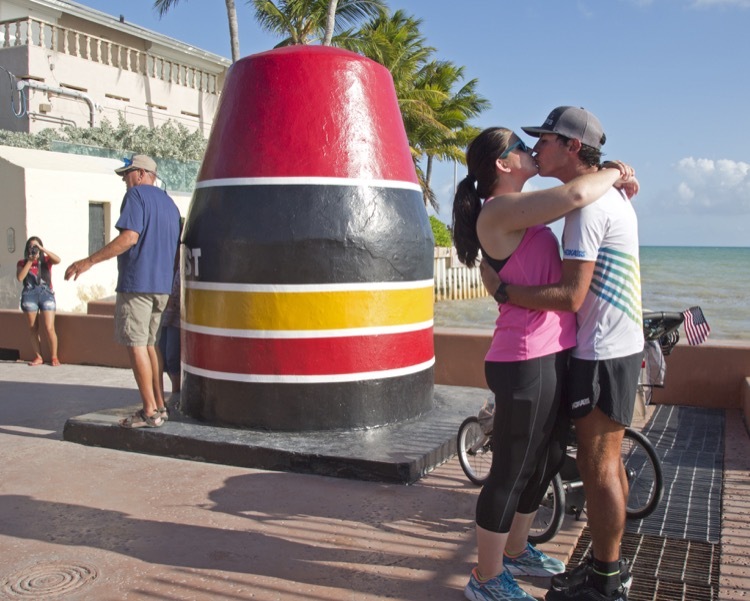 He finished his run at Key West’s southernmost point marker on November 5 surrounded by cheering friends, members of the Florida ultrarunning community and his wife, Nikki. He had run for 97 days, 6 hours and 57 minutes. Kostelnick became the first person to complete a self-supported run, without relying on an accompanying support vehicle, from Alaska to Florida. Pushing his supplies and gear in a jogging stroller, he averaged 55 miles per day on the diagonal route through parts of Alaska, Canada and the United States, for a total of 5,384.3 miles. “It’s been the adventure of a lifetime,” said Kostelnick. Upon arriving at his final destination, he sprinkled a tiny vial of Pacific Ocean water that he had collected on the first day of his run into the Atlantic Ocean.